I warn you now that this may be more rambling than I usually engage in. My two-week media fast was not in search of spiritual clarity or any esoteric goal, but was due to headaches and migraines which blur my vision and exacerbate my light sensitivity. I stayed off the computer for the most part, and only half watched old favorite TV shows to pass the time as pain and medication allowed. Today, since I’m feeling better, the pain is manageable, and my vision is back to normal, I have spent too much time catching up on the news, reading blogs, and reacquainting myself with social media. I think I’ve overdosed. I’m definitely a bit overwhelmed. In this state I am seeing some beautiful and ugly things. For starters, today would have been my parents forty-seventh wedding anniversary (Dad passed on four years ago). Mom posted on Facebook their wedding picture side-by-side with their last formal picture taken on a cruise a year before he died. I’m not sure I had seen those pictures together before and was struck with how little they had changed in forty-two years, and how much happier they actually looked in the most recent picture. A lot of years and a lot of living occurred in the interim, many good and some very hard. 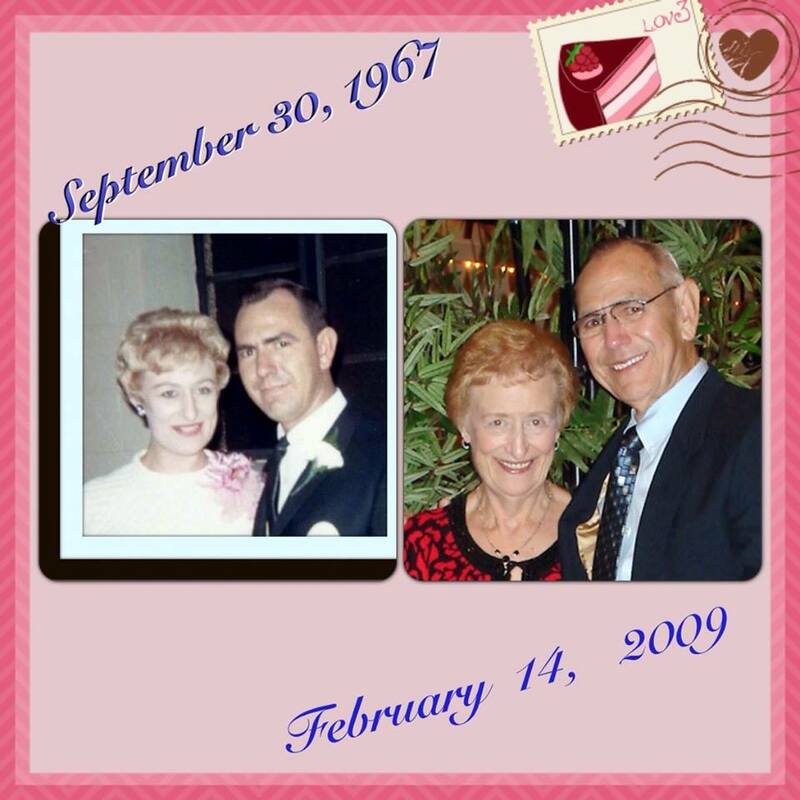 They were a happy and handsome couple when they married in the late 1960s, but in 2009 they appear so much more content, relaxed, and joyful. They had raised a family, suffered many health crises, traveled, fought, spoiled grand-babies, picked up and moved cross-country twice, buried parents and siblings, renovated and wall-papered many homes, loved, and laughed a lot. Where Dad was loud, loved practical jokes and slapstick, Mom is more reserved, sharp witted, and can see the humor and good in most situations–maybe not at the time, but soon after. The few lines I see on their faces in the 2009 picture are not from worry or hard living, but laughter. I hope that is what my children see in me and my husband after forty-plus years together. Additionally, I was touched by all the “likes” and sweet comments from family and Mom’s friends. My parents have invested in other people their entire lives. My brother and I observed after Dad’s funeral how many people came up and introduced themselves as Dad’s “best friend,” or Dad’s “favorite” niece/nephew–he had a way of making everyone feel like they were the most important person in his world. Mom is active and busy enjoying life with friends new and old, and the comments remind me to make every day count as you never know who you are going to encourage along the way. After getting a bit worked up about current affairs, the sorry state of journalism, and the fear-mongering on social media, I opted to read some of my favorite blogs. Ahhh…stress levels lowering. But now I’m feeling convicted. Jeff Goins is again challenging me to write daily. Daily? Oh yeah, that’s one of the goals I set for myself back in January, and that I was debating about with my husband last week. (Hubby believes I’ve set my bar too high–gotta’ love him!) I’m not pleased with feeling convicted for not writing, so I check out two of my other favorite bloggers, Eric Barker’s Barking up the Wrong Tree and Michael Hyatt, who both write about productivity and leadership. I usually get tips and inspiration from them, but now I feel like a slacker. Is that better or worse than feeling convicted? Perhaps both are positive emotions I should embrace. At least now I’m writing something to publish today. In need of some humor and reality I caught up on Jen Hatmaker’s blog. Nope, that didn’t help. This lovely author/pastor’s wife/mom-of-five was traveling in Ethiopia, writing, and raising awareness for the orphans there while I was lounging in the dark and eating soda crackers. So I returned to Facebook and checked in with some of my real-life, personal, writer-friends. One had already cranked out 6,000 words today, another was posting reviews of her latest new release. Yep, back to feeling like a slacker. And then my eye caught Mom’s post of their anniversary pictures again. And I realized that it’s not about the wedding picture or the cruise picture. Those grey hairs and smile lines are the cumulative results of years lived. LIVED. They didn’t waste time comparing themselves to others, or worrying about what they couldn’t do or hadn’t done. They got up every morning, took stock of their situation, did the best they could with what they had, hugged us kids, smiled at friends and strangers alike, and gave thanks for both the rain and the sunshine. I know some days it was easier for them to laugh, and some days required a few tears, but today after nearly half a century together they have a legacy for their children, grandchildren, extended family, and friends that most can learn from. Thanks for posting, Mom. And thanks for teaching me to keep my eyes on Jesus rather than the competition or current events. I hope I pass the legacy on as well as you and Dad did. Connection between Creativity and Environment? Thought-provoking, Kathryn, and an enjoyable read as well. Thanks for your honest and heartfelt sharing. I am a Christian, wife, mother, friend, reader, daydreamer, writer, teacher, stroke survivor, assistance dog partner, and so much more. If you like this blog, please follow. Why's that dog on the bus? Last Minute NaNoWriMo Motivation--Discovering "Why I Write"